Peterborough Pregnancy Support Services is thrilled to be the first official distributor with the Baby Box Company in Peterborough! 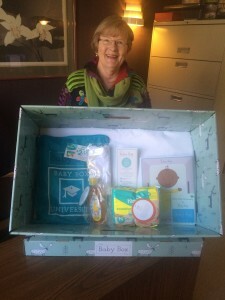 All new and expecting parents, regardless of socioeconomic status, are eligible to receive a FREE safe-certified box in which your baby can sleep anywhere—a practice adopted from Finland where, for the past 80 years, every pregnant woman is supplied with a baby box and other supplies from the state, and they boast one of the world’s lowest infant mortality rate! Valued at $150, each baby box comes with a mattress, waterproof mattress protector and fitted sheet, as well as, various samples for mom and baby. There is also an educational component to the program where parents can learn pregnancy and parenting basics through Baby Box University. The box can be used as a crib (0-6 months or when baby is starting to show signs of rolling over), providing a sleep environment at home or when visiting friends and family. It can later be repurposed as a toy box or memory box. To receive your Baby Box, just sign up at babyboxuniversity.com watch a 15 minute video and show us (staff at PPSS) your certificate of completion. You can do this from your home, your phone or at our centre. Call us at (705) 742-4015 to learn more and/or arrange a pick-up. Click to see us in the news!